Noah wants to go home. A seemingly easy request from most four year olds. But as Noah's single-mother, Janie, knows, nothing with Noah is ever easy. One day the pre-school office calls and says Janie needs to come in to talk about Noah, and no, not later, "now" - and life as she knows it stops. For Jerome Anderson, life as he knows it has stopped. A deadly diagnosis has made him realize he is approaching the end of his life. His first thought - I'm not finished yet. Once a shining young star in academia, a graduate of Yale and Harvard, a professor of psychology, he threw it all away because of an obsession. Anderson became the laughing stock of his peers, but he didn't care - something had to be going on beyond what anyone could see or comprehend. He spent his life searching for that "something else." And with Noah, he thinks he's found it. SHARON GUSKIN lives in Brooklyn with her husband and two sons. She has been a fellow at Yaddo, Virginia Center for the Creative Arts, Blue Mountain Center, and Ragdale, and has degrees from Yale University and the Columbia University School of the Arts. 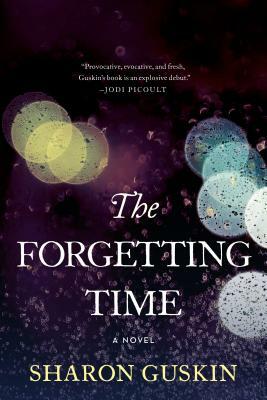 "The Forgetting Time" is her first novel.